• Be able to determine the solubility product constant for calcium iodate by titration of the iodate ion in a saturated solution. • Be able to set up an equilibrium expression for a slightly soluble salt and write out the expression for Ksp in terms of concentrations of products and reactants. • Given the solubility of a slightly soluble salt, in either mol/L or g/L, calculate the Ksp. • Given the Ksp of a slightly soluble salt, calculate the molar solubility. • Given a list of slightly soluble salts and their Ksp values, be able to list the salts in order of increasing solubility. • Given a list of slightly soluble salts and their Ksp values, be able to determine the concentration of ions in solution. Solubility data has many important technological applications in various fields of science. In designing drugs for medicinal purposes, a knowledge of solubility is required to facilitate drug delivery systems, as well as controlling the solubility of the drug in the blood stream. Engineers utilize theory to design water treatment facilities, which remove hazardous chemicals from drinking water. In addition, environmental chemists can explain pollutants by carefully analyzing solubility data. Our solubility analysis begins with analyzing titration data to determine molar solubility and the solubility product constant (Ksp) and will continue in subsequent labs with manipulating the solubility of a slightly soluble salt by analyzing the common ion effect, pH, complex ion formation, and amphoterism. How do the solubility rules relate to the Ksp tables? In Chemistry 121 we discussed the solubility rules by simply stating a set of rules indicating if a compound was “soluble” or “insoluble.” In reality, there are varying degrees of solubility from compound to compound. For example PbF2 and SrSO4 are both “soluble” according to the solubility rules, but it can be determined experimentally that 0.466 g of PbF2 will dissolve in 1 L of H2O, while only 0.092 g of SrSO4 will dissolve in 1 L of H2O. By analyzing solubility equilibria, the chemist can make predictions about the amount of a given compound that will dissolve. The solubility product constant, Ksp, is a measure of just how much of a solid dissolves to form a saturated solution. Your TA will distribute a table of various Ksp values for common ionic compounds. You will refer to it frequently in the solubility unit of this class. How do we go from a balanced equilibrium expression to a Ksp expression? In this laboratory section one of the objectives is to experimentally determine a Ksp value. If we were determining this value for PbF2(s) we would need the concentrations of Pb2+ and F- in solution. Using stoiciometry, if the moles of Pb2+ are known we can convert it to moles of F-. As a result we only need to know the concentration of either Pb2+(aq) or F-(aq). Complete the on-line PRE-LAB ASSIGNMENT, which is due at the beginning of your scheduled lab period. Complete the following example problems in your lab notebook during your lab session. Show them to your TA and have them checked for accuracy before moving on. NOTE: You are highly encouraged to work in groups on the Example Problems, but must perform all chemical experiments individually. Write equations for the solubility equilibrium and for the solubility product constant for each of the following slightly soluble salts. In this experiment it is much easier to calculate the concentration of IO3−(aq) and this concentration is determined by a common technique used by chemists called a titration. In a typical titration the concentration of a certain ion [in this case IO3−(aq)] is unknown and it is combined with a reagent solution whose concentration is known. Chemists refer to the known solution as the standard solution [in this case S2O32−]. Notice that the Na2S2O3 standardized solution is listed as having a concentration of 0.05xx in the lab procedure. It really doesn’t matter if we use 0.0510, 0.0599, 0.0500, or 0.0513 as the concentration of the standard solution, but it is very important that we know the EXACT concentration to four decimal places. In this titration we know the EXACT amount (in mL) of S2O32−(aq) that was used. We also know the concentration of S2O32−(aq) so multiplying the volume times the concentration gives us the number of moles of S2O32−. We then see from the overall equation that for every 6 moles of S2O32−(aq) we have one mole of IO3−(aq). Lastly to get the [IO3−] we need moles and liters. Suppose we titrated 10.00 mL of the solution, take the number of moles of IO3−(aq) obtained and divide it by 0.01000 L. Likewise we can use molar relationships to find the [Ca2+] and plug those values into the Ksp expression and determine the Ksp for Ca(IO3)2(s). Complete the following example problems in your lab notebook before reading on. Show them to your TA and have them checked for accuracy before moving on. To determine the solubility product constant (Ksp) at 50oC for Ni(IO3)2, a chemist prepares a saturated solution of the salt at this temperature. They filter and remove a 10.00 mL aliquot of this solution, and add 50.0 mL of distilled water, 2 g of KI and 10 mL of 3 M HCl to the flask. Thiosulfate solution is added to the flask and after 2% starch solution is added it turns blue. The chemist keeps adding thiosulfate solution from the burette until the solution in the flask turns colorless. It takes 14.58 mL of 0.0515 M Na2S2O3 to reach the endpoint of the titration. The chemical reactions governing the titration are shown above. a) How many moles of S2O32−(aq) are needed to reach the endpoint of the titration? b) How many moles of IO3−(aq)are present at the endpoint of the titration? c) If 10.00 mL of a the saturated Ni(IO3)2 solution was used, what is the concentration of IO3−(aq) at the end point? d) Based on your results from part c), what is the concentration of Ni2+(aq) at the end point? e) Write out the Ksp expression for Ni(IO3)2.
f) Determine the Ksp of Ni(IO3)2 at 50oC. The Ksp of any slightly soluble salt is determined from a saturated solution. In this experiment you will experimentally determine the Ksp of calcium iodate, and in order to do so, you must first prepare a saturated solution of Ca(IO3)2. 1. To prepare the saturated solution of Ca(IO3)2 measure roughly 20 mL of 1 M Ca(NO3)2 into a 250-mL beaker. Next add about 50 mL of 0.2 M KIO3 to the Ca(NO3)2 solution. You should observe a white precipitate. Note: These volume measurements do not need to be exact, so you can use a graduated cylinder to add the solutions to the beaker. We ultimately need to isolate the Ca2+ and IO3– ions in the solution in order to determine their concentrations. To do this we must separate or filter them from the solid Ca(IO3)2. The magnitude of the Ksp is proportional to how much solid Ca(IO3)2 will dissolve. 2. Similar to Figure 2, assemble a ring, clay triangle, and funel with filter in order to perform a gravity filtration. Fold a piece of filter paper in half, then fold it in half again. In order to fit the filter paper snugly inside the funnel, tear off a small part of the corner as shown in the video below. Open the filter paper so that one side of the funnel is in contact with a single layer of the filter paper and the other side of the funnel is in contact with three layers of the filter paper.It seems to work best if the side with the tear has three layers. The paper should be in smooth contact with the funnel at the top, but not near the point. Squirting in water with a wash bottle sometimes helps to keep the filter paper in place. 3. Take the 250-mL beaker from Step 1 and pour as much supernatant liquid through the filter paper as possible, trying your best not to disturb the precipitate. Use a wash bottle filled with distilled water to wash down the sides of the beaker. Swirl the wash water with the solid and quickly pour the mixture on the filter paper. Rinse any remaining solid onto the filter paper with a small amount of water from your wash bottle. 4. Wash the solid Ca(IO3)2 on the filter paper with three small portions of distilled water. 5. Using a microspatula, transfer roughly 1/3 of the wet precipitate to one 100-mL beaker. Leave the left over precipitate on the filter paper. You will only use the precipitate on the filter paper if you mess up one of your trials. 6. Rinse your 100-mL graduated cylinder with distilled water and use it to add 80 mL of distilled water to the beaker containing the wet precipitate. 7. Acquire a stirring motor from the balance room and a stir bar from your TA. Place the stir bar into the beaker containing your 80 mL of water and your Ca(IO3)2 precipitate. 8. 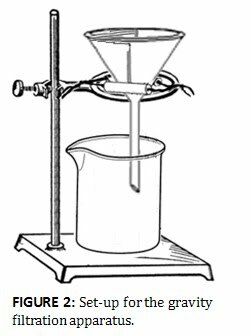 Place your beaker on the stirring motor and turn the stirrer on to its lowest speed setting and allow it to stir in order to obtain a saturated solution. While you are waiting for your solution to reach equilibrium complete the following problems in your lab notebook, which must be checked off by your TA before you continue. Note: the following problems were taken from Quiz I given during the past two quarters. The solubility product constant for Cu(IO3)2 is 1.44 x 10-7. What volume of 0.0520 M S2O32- would be required to titrate a 20.00 mL sample of a saturated solution of Cu(IO3)2? The solubility product constant for Sr(IO3)2 is 1.14 x 10-7. What volume of 0.0250 M S2O32- would be required to titrate a 20.00 mL sample of a saturated solution of Sr(IO3)2? (a) Write out the Ksp expression for lead iodide. (b) 25.00 mL of a saturated PbI2 solution was titrated with 0.0524 M Ce(NO3)4. The first step of the reaction sequence was performed and a starch indicator was added to the solution turning it blue. After 1.240 mL of the Ce(NO3)4 was added the end point was established as the blue color indicating the presence of I2 turned clear. From the results of this experiment, calculate the Ksp of lead iodide. Once you get your TA to check off these example problems, you are finished with Day #1 of this lab. Write your name on the Erlenmeyer Flask containing your saturated solution with a Sharpie, place Parafilm over the top of the flask, and hand it to your TA. You will start by filtering this solution at the beginning of the next lab period. 9. In order to ensure you have a saturated solution of Ca(IO3)2, the mixtures set aside from Step 8 must not contain any solid. Filter the saturated solution in the same manner as Step 2, but for this step use a clean, dry 125-mL Erlenmeyer flask to catch the filtrate. Any glassware, as well as the filer paper, must be dry in order to calculate an accurate concentration of IO3–. 10. Rinse a 10-mL pipet with two small portions of the saturated Ca(IO3)2 solution. You may discard any rinse solutions down the drain. 11. Pipet 10.00 mL of the saturated Ca(IO3)2 solution into a 250-mL Erlenmeyer flask. With a Sharpie, label this flask TITRATION FLASK. In this experiment we will utilize the following set of oxidation/reduction reactions to determine the number of moles of IO3– present in 10.00 mL of a saturated Ca(IO3)2 solution. At this point, you have a clear solution containing Ca2+(aq) and IO3–(aq). In a titration an indicator is often used and these indicators exhibit vivid color in solution. If we add excess I– to the solution (done in this experiemnt by adding solid KI) and excess acid (in this case 3 M HCl will work just fine), then all of the IO3–(aq) will be oxidized to I2(aq). We can verify that I2(aq) is present due to its brown color in solution. As the second step of the reaction sequence indicates, whenever thiosulfate (S2O32–) is added to a solution of I2, the I2(aq) will be reduced to I–(aq). Whenever a small amount of I2(aq) is in the presence of a starch indicator, a dark blue complex will form. When the solution turns from blue (or brown) to colorless, we know that all of the I2(aq) has been reduced to I–(aq). 12. To your TITRATION FLASK, add approximately 50 mL of water using a graduated cylinder and 2 g of solid KI. In addition, add about 10 mL of 3 M HCl and swirl. This is converting all of the IO3–(aq) to I2(aq), which will turn the solution brown. IO3−(aq) + 5 I−(aq) + 6 H+(aq) → 3 I2(aq) + 3 H2O(l). 13. Now we are ready to perform the titration with standardized 0.05XX M Na2S2O3. Find the 0.05XX M Na2S2O3 on the cart and record its concentration to four decimal places in your lab notebook. Use this solution to rinse a 25-mL buret twice, then perform three titrations. 14. In each of your titrations, fill the 25-mL buret with 0.05XX M Na2S2O3 and record your initial buret reading. Begin your titration and as the titration proceeds you will observe the brown color of the I2 solution lighten to a more yellow color. When you observe a yellow color stop the titration and prepare a fresh starch solution by adding 0.6 grams of vitex starch to roughly 30 mL of distilled water in a separate 250-mL Erlenmeyer flask. 15. Add about 4 mL of the starch indicator solution to the TITRATION FLASK and in doing so, you should observe a blue (or dark brown) solution. 16. Continue the titration until you reach the endpoint, which is the moment the solution turns colorless. 17. Record the final buret reading at the endpoint. 18. In your lab notebook, calculate the number of moles of S2O32−(aq) required in the titration. 19. Calculate the molarity of IO3− for your first titration. 20. Refill the buret and perform two more titrations given in Steps 11 – 17. 21. If any of the three titrations do not agree to within 0.2 mL, perform another titration. 22. For each trial, calculate the molarity of IO3−, and calculate an average molarity of IO3− with the three trials that agree within 0.2 mL. 23. Using the stoichiometry of the ions in solution, calculate the concentration of Ca2+ from your average molarity of IO3−. 24. Calculate the Ksp for Ca(IO3)2. 25. Complete the on-line REPORT SHEET, which is due at 11:59 pm the day of your lab. 27. Complete the on-line REPORT QUESTIONS, which are due at the start of lab one week after you complete this experiment. The Ksp values for most compounds are fairly straightforward to understand, but typically what a chemist wants to do is somehow manipulate the solubility of these compounds. What happens to the solubility when we increase the temperature? What happens when we change the pH? What happens when we add a common ion? In the Qualitative Analysis Experiments and in class in the next few weeks we will talk about how each of these scenarios can influence the solubility of a complex. But before you learn how to manipulate the solubility you have to have a thorough understanding of how a Ksp expression is set up and if you are given a molar solubility you should be able to calculate the Ksp. If you are given the Ksp you should also be able to calculate the molar solubility.